Summary: 80% of mobile banking and payments users say they want to use biometric authentication. What your bank should know about the recent developments of biometrics. 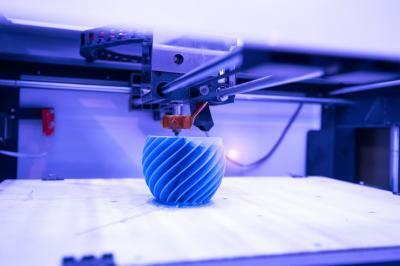 Some community bankers have been keeping a close eye on 3D printing because as it continues to evolve, it is likely to eventually impact lending opportunities. These printers have already "printed" such things as apartment buildings and houses, for instance so the idea is interesting. MIT now reports they have found a better way and have announced a 3D printer that can print 10 different materials all at once. Even more amazing - it does so while auto correcting and auto calibrating itself along the way. That means we will soon be able to embed complex things such as sensors or circuits into manufacturing activities using these printers. The sky is the limit now, so bankers should keep a close eye on the horizon, as usage of these sorts of machines begins to really ramp up in the coming years. Speaking of advancements that bankers have been monitoring, we circle back to biometrics. Sure, banks have been talking about the opportunities to use biometric authentication for at least 20Ys. However, improvements and decreasing cost for the technology, coupled with the fast-paced growth of remote services (like mobile banking), are now encouraging banks to look to this as a more practical form of customer authentication. Indeed, in the mobile world biometric identification has been a standard part of iPhones for 3Ys. That has made consumers more comfortable and accustomed to having their eyeball scanned or offering their fingerprint as proof of their identity. For banks, the benefit of biometric identification promises to be multi-pronged. In addition to better remote authentication and less fraudulent access perhaps, biometrics may help banks with "know your customer" compliance. Demand for the added level of security seems to be driving much of the biometrics development. In fact, 80% of mobile banking and payments users say they want to use biometric authentication, even beyond fingerprint recognition, according to a 2017 survey from Eyeverify. Even more startling, the study found that a full 42% said they would not even use a mobile banking or payments application which did not provide some kind of biometric identification. Consumers are using biometrics every day. An increasing number of people are using fingerprint, retina scan or even facial recognition in their work environments and on their smartphones. Fingerprint readers are no longer the stuff of science fiction novels, but a daily part of life. Case in point: The market for biometric vendors is expected to more than triple from less than $11B in 2015, to nearly $33B in 2022. Bank customers are less likely to resist, or be uncomfortable with, this form of authentication when they are already familiar with it. Biometric authentication is easy for customers. This form of identification does not require passwords or PINs. Users just authenticate by holding down their finger, scanning an eye, saying something using their voice, etc. Applications then use this information to "know" who you are. Financial research firm Aite Group finds 73% of Millennials and 68% of Gen Xers believe facial recognition is an easy way to identify themselves. Further, 86% of mobile users in the Eyeverify survey say biometrics make logging in to applications much easier than entering a password and more secure. For bankers, ease of use can mean more use, which means more frequent and faithful customers perhaps. Biometric security is rising. Advances are ongoing and biometric identification is yet another way for your bank to show customers you are willing to go to new lengths to help them safeguard accounts. According to the survey, 78% of respondents said mobile applications that utilize biometrics for authentication are more secure than those that do not, and 82% said fingerprint, retina scan or facial geometry are more secure than a password for mobile banking and payment transactions. Knowing all of this, now may be the time for your bank to take a deeper look into biometric authentication. Yields jumped 6bp as Q3 GDP unexpectedly reached 3.3% and pending homes sales increased by 3.5%. Mick Mulvaney in his first day as acting director of the agency imposed a 30 day freeze on new regulations, hiring, civil money penalties and guidance. 1) PNC Bank (PA) will acquire financial advisory and investor relations firm The Trout Group (NY) for an undisclosed sum. 2) Florida Community Bank ($10B, FL) will acquire Floridian Community Bank ($545mm, FL) for about $88.1mm in stock (100%) or about 1.72x tangible book. 3) Byline Bank ($3.3B, IL) will acquire First Bank & Trust ($1.1B, IL) for about $169mm in cash (17%) and stock (83%) or about 1.7x tangible book. Adobe reported that Cyber Monday showed almost 40% of online sales were done through mobile devices - a 41% increase over last year. Bankers should note this while planning their online and mobile offerings.